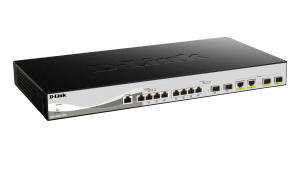 The DXS-1210-12TC 10 Gigabit Ethernet Smart Switch is a cost effective 10 GbE switch capable of servicing a range of network needs in any business. Supporting 10GBASE-T/ SFP+ combo ports, it provides connection flexibility across a network allowing easier network integration. The DXS-1210-12SC 10 Gigabit Ethernet Smart Switch is a cost effective 10 GbE switch capable of servicing a range of network needs in any business. Supporting 10 SFP+ ports and 2 10GBASE-T/ SFP+ combo ports, it provides connection flexibility across a network allowing easier network integration.